Revenue Growth? Try the ‘5% Challenge’… it’s Brilliant! I’ve known John Boyens for more than 15 years now. John is the Founder of the Boyens Group and is one of the top sales and management consultants and trainers in the country. 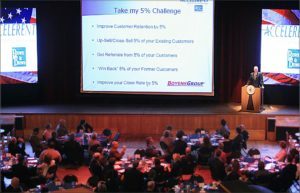 John recently delivered a presentation on revenue growth at a conference (see photo) where the topic was his “5% Challenge!” The premise of his challenge is that several types of small, incremental gains (5% gains, to be exact!) can lead to significant revenue growth. As I looked at the details of the challenge, I couldn’t help but think that they were a great fit for our industry, as well. Challenge 1: Improve client retention by 5%. Look at your business over the past 5 years. What percentage of your clients in 2012 returned in 2013? And what percentage of your 2013 clients returned in 2014. And so on… and so on. Imagine if you could have retained just 5% more of your client base… what would that mean for your business? And, for your largest clients, by establishing a Key Account strategy to take especially good care of them. Challenge 2: Up-sell/Cross-sell 5% of your existing clients. Remember this: it’s a lot easier to sell to an existing client than to a new one… and the one that’s in the midst of a project is the easiest of all. Why? First, they already know you / like you / trust you. Next, because they’re already spending money with you… if you have a recommendation that will improve the outcome of their project, it just makes sense to ask it right then and there. It could be something as simple as a focus group facility manager asking a client if they’d like a bottle of wine with the dinner they just ordered. Or something a little larger… perhaps suggesting an additional question to a client that’s participating in an omnibus study. Challenge 3: Get referrals from 5% of your clients. When I was going through my due diligence before starting Harpeth Marketing, I asked scores of researchers across the country about their marketing efforts… and ‘referrals’ were at or near the top of everyone’s list. Referrals, between trusted colleagues, convey a level of credibility not generally associated with most marketing and sales tactics. The problem with referrals is this… there are never enough of them – no matter how good you are. So, let me suggest this… ASK FOR THEM! There is no harm in asking… and you never know where it will lead. Challenge 4: Win back 5% of your former clients. Look back at Challenge 1 (client retention)… and think about that year-over-year analysis. How many clients have you lost in the past 5 years? Do you know why you lost them? More importantly, what have you done to try to earn back their business? There is absolutely no downside in trying to re-engage with former clients. If they choose not to reciprocate, then you’re no worse off than you are now. But for those that do, you actually have a leg up… they know you, they’re familiar with your services and there’s even a certain level of trust. Assuming you did good work for them, the reason they left you is more than likely a lack of regular and frequent communication. Well, here’s your opportunity to fix that and start to win them back. Challenge 5: Improve your close rate by 5%. In my interactions with research firms across the country, ‘close rates’ have shown to be remarkably consistent – about 2 wins for every 5 bids… 40%. Assume you win 2 out of every 5 bids… and that happens every month. That’s 24 out of 60 every year. With a 5% increase in your close rate, that becomes 27 wins. Those 3 extra wins – at an average project value of $30-35,000 – is $100,000 in new revenue! Develop a more succinct proposal… skip the 10-page introduction on ‘what we do’ (they already know that!) and get right to what they want to know. Develop an effective use of ‘proof sources’ – those things that show you can do what you say you can do. This could include case studies, white papers, a list of references and a website full of testimonials. 5%. Doesn’t sound like much, does it? But it does sound very achievable! So, take another look at John’s ‘5% Challenge’ and make plans for integrating those ideas into your 2017 revenue growth goals! Good luck and good selling. And thanks, John.